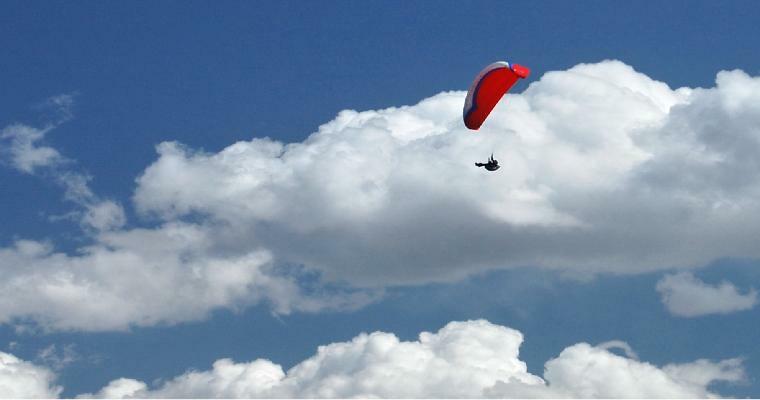 Vail Valley Paragliding - What is a Paraglider? sometimes stay aloft for hours, soaring over the countryside like an eagle. a few steps, and pull gently on the brakes of a wing, and you will begin to R-I-S-E.
about five and a half hours. like a rucksack by pilots hiking their way to a lonely hilltop far from the road. of an hour will see you packed up and ready for home. is ideal. You can take the cable car to then fly all the way down to the bottom again. form of flying machine, is a growing sport. While most paraglider pilots are men, it's a sport at which women are extremely good. to find pilots in their early 70s still keenly pursuing the sport. Watch this Video on YOUTUBE CLICK HERE !! !